When I was a kid I tried to play the piano, but I just ended up faking it and playing by ear. In high school I pretended to be interested in sports, but that was a flat-out lie. With this in mind I went into The Avengers genuinely excited and ready to embrace it, but I quickly realized that I was going to have to fake my adoration once more, or come clean. Before I go any further, it should be said that I love comic books, I love (well-done) comic book movies and I love Joss Whedon. Combine these all together and I should’ve been spasming on the floor with excitement during the movie. Since Marvel began their production company with Iron Man in 2008, I have applauded the care and effort they have put into their film-spanning, world-building saga, leading up to The Avengers. The fact that this movie was being made was an amazing feat to accomplish. And that’s pretty much all that happens. This is not to diminish the very witty and classic Whedon snarkified script and dialogue, because there are some truly great banter scenes among the highly-populated cast. Robert Downey Jr.’s Tony Stark obviously chews on the scenery a little much, but that is to be expected and enjoyed. I was worried about Chris Evans (Captain America) standing toe-to-toe with Downey Jr., but he impressed me and held his own. The Hulk also fares much better in an ensemble than he does in the lead role; often providing a lot of unexpected humor. The old cliché is “a hero is only as strong as his villains;” overstated or not, there is always some truth in clichés. Tom Hiddleston brought a lot of great emotional conflict into the Loki role in Thor. In Avengers however, the conflict is gone, leaving us with a full-on evil bad guy, which makes for a less interesting character. The super-hero movie has become its own genre. When Superman came out in 1979 people “believed a man could fly” because they had never seen anything like it before. Long before that, audiences were similarly amazed by George Méliès’ A Trip to the Moon, because they also had never seen anything like it before. I said earlier that the fact that The Avengers was being made was an amazing feat to accomplish, and it definitely is. But super-hero movies have come to a place where cinema in general came to long ago: It’s not enough to show that something amazing has happened, you have to show why it’s amazing. 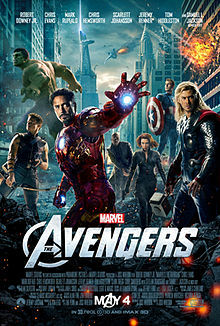 The Avengers is certainly a fun movie, but it never reaches the emotion or struggle that it strives for.